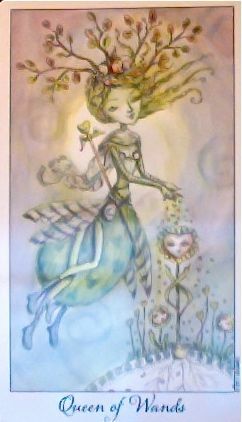 Today's Draw: The Queen of Wands from the Joie de Vivre Tarot by Paulina Cassidy. How big is your dream for yourself? How much do you believe in yourself on a scale from 1-10, with 1 being not at all? What would it take for you to dream bigger and believe harder? Her name is Queen Zest and she feeds her garden with love and the warmth of her spirit. If you listen closely, you may hear her whisper in your ear, "believe in yourself". Such a simple request, but so hard to do. We're such complicated creatures made up of fears and baggage, all pointing us toward self doubt. But if you take the Hanged Man's advice from yesterday and look at it from a different perspective, you'll see a lifetime of right turns and successes. Sometimes we're so focused on what we don't have, that we neglect to see all we do have. The way I see it, we're all divine beings. That includes your grumpy boss, prisoners in jail and yes, even you. We were all borne from the higher consciousness and all of us have taken on different agendas in our lives. I don't know why my sister has had to struggle to find a job in this economy (until today!) or why my brother has to battle cancer. I don't know why some people can't be nice and why some who are keep getting bad breaks. But I'm certain of two things—one is that you're a child of God or the universe or whatever you believe in. And the other is that whatever you're going through is absolutely necessary to your mission here on earth. You haven't made any mistakes or wrong turns. And you are infinitely capable of rising above whatever it is that is holding you down. All you have to do is accept and believe in your divine legacy. Now, for the doubters out there, I'm not telling a quadriplegic they can become a professional football star. What I'm saying instead is that they can rise above their limitations and achieve great things. The internet is littered with stories of people who are bigger than their limitations. And they got that way by refusing to believe their challenges defined them or limited them. You and I don't have such dramatic roadblocks to overcome. So what's our excuse? I recently spent some time with a friend who is a medium and he contacted my parents. My mother communicated to me that I was bigger than my current ambitions. I wouldn't normally see myself as someone who doubts my abilities, but I see now where she was right. The universe's dream for me is bigger than the dream I have for myself. And the same is true for all of you. Consider this as you move through your day and see how much bigger you can make your dream. Then believe in yourself and move toward it, knowing you're supported by a vast and loving universe.